Bryan Mills’ family is beginning to recover from the shock of Kim having been sold as a slave by human traffickers. This time, Lenore (Bryan’s ex and Kim’s mother) is separated from her second husband and going through a rough patch. Kim is dating a young guy and taking driving lessons from her father. On short notice, Lenore’s soon to be ex-husband cancels plans he has to spend time with Lenore and Kim, and Bryan invites them to travel to Istanbul to spend time with him where he will be on an assignment. Soon after Lenore and Kim arrive in Turkey, the family of the men who took Kim last time come looking for Bryan to avenge the deaths of their relatives. Lenore and Bryan are kidnapped but Kim escapes unscathed. It is up to Kim this time around to find out her parents’ location and save the day…with her father’s help, of course. Good movie but not great, not even remotely to the level of the first Taken; there is less drama in spite of the obligatory chase scenes round Istanbul, and the killing of one guy after another. 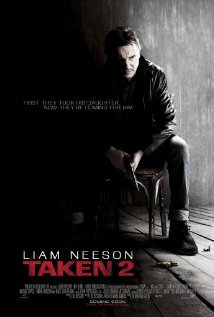 Taken 2 feels too familiar and predictable after the events narrated in the first installment. Besides, how much more of the same can that family take? Liam Neeson is great as always as the leading character Bryan Mills, and Maggie Grace, as Kim, has a more active role than crying and screaming this time around. Famke Janssen co-stars as Lenore, a.k.a. Leny. Overall, Taken 2 is OK to watch, but it isn’t as good or as smart as the original.